In large table mode, you will no longer be able to use the Retrieve Data option. Instead you can build the structure of the table and then download the data as a file. When you have finished creating the structure for your table, select a download format from the Download Table drop-down list and then click either Go or Queue Job (the option will depend on how your system has been configured). Depending on your browser, the file will either be saved to your default downloads folder, or you may be prompted to choose whether you want to Save or Open the file. If the button says Queue Job then this means your system has been configured to use the Job Queue Manager feature. This is designed to run large jobs in the background. Your tabulation job will be queued for processing and you will be able to download it when it is ready. You can also log out of SuperWEB2 and come back later. 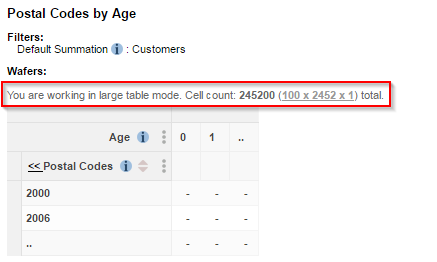 Your query will continue running in the background and you can retrieve the results from the Saved Tables page when you log back in.